A man killed his sister and critically injured his mother in a knife attack at a flat in Wolverhampton. The 36-year-old attacker is then understood to have turned the knife on himself and died at the scene. 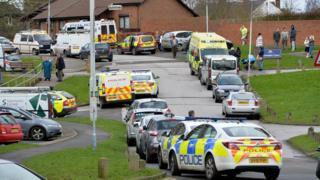 Stun grenades were used as officers stormed a first-floor flat in Leasowes Drive, Merry Hill, at about 09:45 GMT. The 33-year-old sister also died at the scene. The 59-year-old mother of the man and woman suffered stomach wounds, West Midlands Police said. Two police officers were also injured in the attempt to arrest the knifeman. The names of the dead and injured have not been released. West Midlands Ambulance Service said the mother was taken "to the major trauma centre at the Queen Elizabeth Hospital, Birmingham with potentially life-threatening stab wounds". Armed officers could be seen outside the Highfield Court block of flats. 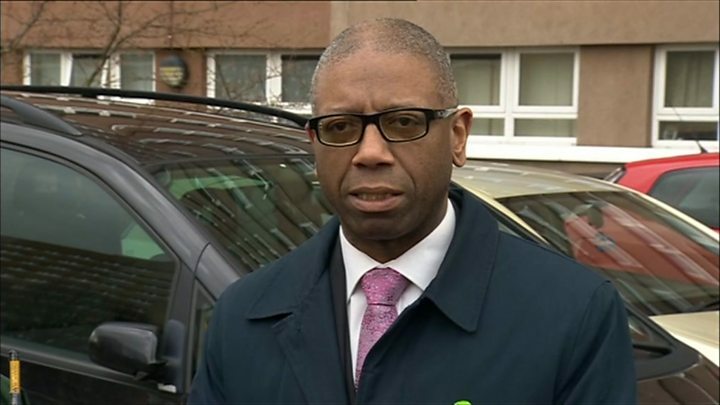 Supt Keith Fraser, from West Midlands Police, said unarmed officers who had entered the property to protect people inside were confronted by a man with a knife and they "deployed their Taser, which was initially ineffective". He said armed officers had "then been requested to support the unarmed officers" and they "have used stun grenades to distract the armed man". But the stun grenades were "ineffective we believe in relation to trying to stop this man from attacking officers". One officer received a "stab wound to the arm" and the other sustained a leg injury after being chased by the suspect, Supt Fraser said. "I want to stress that the man was armed so we had to act quickly and officers did that." Mick Brice, a taxi driver, was near the scene when he said he saw "12 or 14 police cars". A "paramilitary-style" police vehicle came "screaming down the road" and on to the scene, Mr Brice said, before he saw two officers take something out of the back and enter the flats. The Independent Police Complaints Commission (IPCC) said it had been notified of the incident and had started an investigation. An IPCC spokesman confirmed the killings had been referred to it by West Midlands Police. He added: "It relates to contact that police had with the man." Post-mortem examinations are scheduled for Thursday.